With only one day left to campaign, Ontario leaders make a hard, final push for voters ahead of Thursday's vote amid allegations of dirty tricks. With only one day left to campaign and polls pointing to a tight two-way race between the Liberals and Progressive Conservatives, Ontario leaders are making a hard, final push ahead of Thursday's vote. The final day of campaigning comes as allegations of dirty tricks begin to surface. On Tuesday, the PCs had to apologize after voters in two ridings — one in Ottawa, another in London — received letters containing false information about where to vote. The Liberals accused the Tories of "voter suppression," while the PCs said the letters were sent in error. The Tories were furious over a Liberal campaign flyer issued in Vaughan by candidate Steve Del Duca. The flyer featured an image of PC Leader Tim Hudak laughing maniacally as he walks away from a hospital exploding in the background. The ad takes its inspiration from the Batman movie The Dark Knight, with Hudak in the role of the Joker. Del Duca took to Twitter Tuesday to apologize to Hudak, calling the flyers "a mistake." But Tory deputy leader Christine Elliott called it a deliberate "sickening" attack, while a letter from the PC campaign manager called it a "piece of terrorist literature." The Tories sent out videos Wednesday that show Liberal York Centre candidate Monte Kwinter's staff ripping down a PC candidate's campaign sign, while Kwinter sits in a nearby chair. PCs said they have raised the matter with Toronto police. In a statement issued early Wednesday afternoon, Kwinter admitted his staffers took down the sign, but said it was screwed to a utility pole located between the curb and sidewalk, a bylaw violation. "In hindsight, our campaign volunteers should have called a city bylaw officer instead of taking matters into their own hands when they attempted to remove the illegal sign," said Kwinter. Kwinter also claimed PC staffers taunted him about the sign and quoted them as saying: "Go ahead and call the bylaw officer, by the time they get here, the election will be over." From the early days of the campaign, Hudak has stuck to a simple, unwavering message: A PC government will make deep cuts to the public service in a move to bring jobs to the province and eliminate the deficit quickly. Jamie Watt, chairman of the Navigator Communications public relations firm, said Wednesday on CBC Radio's Metro Morning that Hudak likely won't deviate from that message as the campaign enters its final hours. 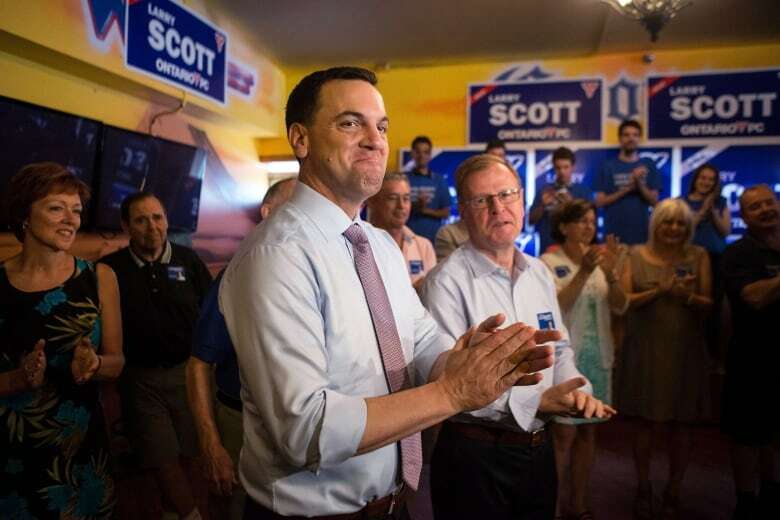 "Hudak has had a lot of success with his message," said Watt. "Some people hate that message, but it's very clear what he's running for." Hudak has spent much of this week focusing on the ridings that ring the Toronto area known locally as "the 905," a reference to the region's once dominant telephone area code. On Wednesday, Hudak will swing through Mississauga, then move southwest to Waterloo, Niagara Falls and Jarvis. On Wednesday, Hudak accused Wynne of running a "campaign of fear" by visiting hospitals and schools during the campaign. Hudak insisted he's offering voters a positive message about new jobs. "We've talked every day about our optimistic and bold plan to get people back to work, and in the last 24 hours I'm going out with a campaign of hope," he said. "I know that hope is going to trump fear come Thursday night." CBC reporter Genevieve Tomney reported this week that the Liberals have kept Wynne somewhat under wraps in the campaign's final days. On Wednesday, Wynne cancelled a noon appearance on CBC Radio's Ontario Today — an hour-long call-in show — citing a change in her campaign schedule. Brad Duguid, Liberal candidate for Scarborough Centre, appeared in Wynne's place. This is Wynne's first campaign as party leader and an underwhelming performance in last week's debate of the leaders has left her in a dogfight with the PCs, with the NDP running a distant third. Many of her campaign stops this week have offered no opportunity for reporters' questions, a suggestion the Liberals want to play it safe until the final buzzer. It's telling that Wynne will spend the final day of the campaign in Toronto, where the ridings tend to be races between the Liberals and the NDP. Wynne's itinerary has eight stops on her schedule. Much of Wynne's campaign has been a reaction to Hudak, with the Liberals trying to portray him as a hatchet man and protegé of former Tory premier Mike Harris. Wynne has said Hudak's plan to cut 100,000 civil service jobs will throw the province into chaos. She has also tried to pick apart the murky math in the Progressive Conservatives' "Million Jobs" plan. But Wynne has also had to focus on the NDP as well. Early this week, Wynne made a plea to left-leaning voters, imploring them to vote Liberal as a way to block Hudak's path to the premier's office. Wynne also admitted the race is essentially a tie between her and Hudak, telling "progressive" voters that an NDP vote isn't the way to prevent a PC government. An all-out blitz is the best way to describe how Horwath has spent the final week of the campaign, and that will continue Wednesday. The NDP leader has a staggering eight stops on her itinerary, stretching from Mississauga west of Toronto to Kingston, almost 300 kilometres away. None of the stops are in ridings currently held by the NDP. On Tuesday, Horwath led a similar charge through close ridings in southwestern Ontario. Speaking on Metro Morning, Watt said this hasn't been Horwath's best campaign, but she could play a key role should a minority government emerge after Thursday's vote, which polls suggest is a distinct possibility. The Liberals raised the prospect of an NDP-PC coalition, an idea Horwath shouted down Tuesday as "bullspit." A strong NDP showing at the polls could come at Wynne's expense. Horwath has accused the Liberals of scare tactics in their move to woo left-leaning voters, and called on Ontarians to "vote with their heart." Horwath has portrayed the Liberal and PC options as a choice between "corrupt and crazy." Expect that to continue Wednesday. Delivers remarks. Media availability. 8:15 a.m., 80 Queensdale Ave. Meets with local supporters. Photo-op only. 1 p.m., 2360 Danforth Ave. Meets with local supporters. Photo-op only. 3:30 p.m., 1220 St. Clair Ave. W.
Meets with local supporters. Photo-op only. 4:45 p.m., 73 Roncesvalles Ave. Meets with local supporters. Photo-op only. 6 p.m., 374 Royal York Rd. Mississauga - Media availability. 9:15 a.m., Newmar Windows Manufacturing, 7630 Airport Rd. Waterloo - Photo-op. 1:30 p.m., Tracy Weiler campaign office, 55 Erb St. E.
Niagara Falls - Photo-op. 4 p.m. Bart Maves campaign office, 4536 Portage Rd. Jarvis - Town hall and photo-op. 7 p.m., 2050 Highway 6 South. Mississauga - Whistlestop with Mississauga-Streetsville candidate Anju Sikka, Mississauga South candidate Boris Rosolak. Mississauga East-Cooksville candidate Fayaz Karim. Mississauga--Erindale candidate Michelle Bilek and Halton candidate Nik Spohr. Media availability. 8:10 a.m. 1201 Britannia Rd. W.
Brampton - Whistlestop with Brampton-Springdale candidate Gurpreet Dhillon, NDP Bramalea-Gore-Malton candidate Jagmeet Singh. Media availability. 9:25 a.m. 50 Sunny Meadow Blvd, Unit 307. Toronto - Whistlestop with Etobicoke Centre candidate Chris Jones, Etobicoke North candidate Nigel Barriffe, Etobicoke-Lakeshore candidate P.C. Choo, Vaughan candidate Marco Coletta. 10:40 a.m., 235 Dixon Rd., Unit 13. Toronto - Whistlestop with Scarborough Guildwood candidate Shuja Syed, Scarborough Agincourt candidate Alex Wilson, Scarborough Southwest candidate Jessie Macaulay, Markham--Unionville candidate Nadine Hawkins. 1:15 p.m., 7-3585 Lawrence Ave. E.
Oshawa - Whistlestop with Oshawa candidate Jennifer French, Ajax-Pickering candidate Jermaine King, Pickering-Scarborough East candidate Eileen Higdon and Durham candidate Derek Spence. Media availability. 2:45 p.m., 50 Simcoe St. N.
Belleville - Whistlestop with Prince Edward-Hastings candidate Merrill Stewart. 4:55 p.m. 59 Dundas St. E.
Kingston - Campaign event with federal NDP Leader Tom Mulcair and Mary Rita Holland. Media availability. 6:45 p.m., 76 Princess St.